Gigabit Ethernet ports operates 10X faster than the standard, which helps your wired devices achieve peak performance. The USB port helps you share content from your connected USB storage devices. With combined speeds of 867Mbps on the 5GHz band and 300Mbps on the 2.4GHz band up to 1200Mbps，the combined speeds is fast enough to transfer your large digital files and stream high definition video, it is an ideal router for your bandwidth-intensive tasks. By automatically assigning devices to the best available channel, the router can connect more devices at the same time. 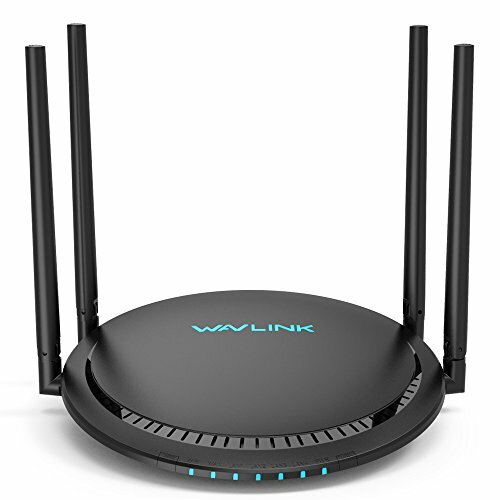 The antennas boost the receiving sensitivity and sending ability of the router, which maximize Wi-Fi range and greatly improve network performance. Beamforming technology detect the location of your devices and concentrate wireless signal strength toward them. This makes all of your connections more efficient and stable. WAVLINK APP helps to manage the network settings from any Android or iOS device and remote management anytime and anywhere, enjoying the stable and strong signal. The black finish and soft matte surface with ergonomic tilt of 15° discreet design all turns into a perfect industrial artwork.